Whether you’re changing jobs or launching a company, Brett Eddy is your go-to guy. With a spark of mischief in his eyes and a quick smile, he’s recognized for being an innovative business leader in the Kitsap County boom. A facilitator of conversation, ideas and thinking processes, Brett’s presence is intensely focused; he’s no nonsense. But he is also motivated by compassion for up-and-comers who are testing the waters of entrepreneurship. Long-time Kitsap resident Brett Eddy knows both the joys and pains of living the commuter life. Today, Brett helps companies with their strategic problems and dreams, including advising large companies and smaller, more nimble ones from right here in Poulsbo. “I ask those tough questions and point out the elephants in the room to sift through people’s startup ideas. My passion is helping them evaluate what’s possible while problem solving from the get-go. The goal is to bring good business ideas to life,” Brett offers. As founder of both Eddy Digital and Ignition Garage, and as one of the very first to come on board as a Vibe Founding40 member, Brett is a known entity around these parts. Ask Vibe cofounder Alanna Imbach about her take on Brett, and she'll tell you that she's "rarely met someone with such generosity of spirit when it comes to being willing to sit down, mentor people, and find solutions that stick." Brett also stands out for having an exceptionally good head on his shoulders when it comes to work-life balance. For him, relationships come first. This is a guy who will be the first to encourage you to connect, travel, get out there, spend time with loved ones. A rare bird, indeed. What's your best dance move? Brett: I don’t have one. I hope to learn the dab one day. Where did your love of technology start? Brett: While other kids on the block were out playing kickball, my buddies and I took our BMX bikes and headed to the appliance store. In the early days, that’s where PCs were sold. To the left were the fridges, to the right, dishwashers, and right in between on a non-descript shelf were a couple of brand new personal computers. The salespeople had no idea how to sell these things. But a few of us early geeks knew that these machines were the future. Back then, in pre-internet days, technology was changing the world as software was just hitting its mainstream stride. We’d grab Compute magazine, huddle around my buddy’s TRS-80 Color computer and stay up and program some game until late. That’s where it all began for me. Name the 3 most important attributes for an entrepreneur to possess. Brett: Endurance. Endurance is an attribute that serves mankind in profound ways. In the world of startups and entrepreneurship, it takes grit to overcome the millions of obstacles that get in the way. Another attribute would be execution. Execution is one of those business buzz words that is easy to throw around and difficult to champion. Starting a million things, but never finishing, is not execution. Finishing, as long as the idea is a good one, and then seeing the fruits of your labor—that’s execution. Problem Identification. What problem are you solving? How does your vision satisfy a need? That’s probably the first question entrepreneurs need to ask themselves. That’s the start of any real conversation regarding a new idea or company. Tell us a bit about 'Project Alpha'. Brett: Right now, it’s a conversation. Project Alpha is going to need a lot of people to make successful—it's somewhere between a company and a movement. community and investing in the next generation. One of the reasons I originally was connected to Vibe Coworks founder, Alanna Imbach, was because there was such a complimentary overlap between my Project Alpha concept and both Vibe and coworking in general. One of my mentors said, “You’ve got to write this down, evangelize it.” So, I began pitching Project Alpha to public leaders, city leaders, tech leaders to get a conversation going. How do you see this philosophy impacting our community network? Brett: Here in Kitsap, our kids are graduating [high school] and leaving. We have a great opportunity to help these young people stay here with specific training that will provide viable income for them. The fact is, we have more open technology jobs in the nation than just about any other industry; demand far outweighs supply. We can’t graduate computer science students fast enough. Network administrators, database administrators, production operations pros, web developers, security professionals—all are relevant for the health and growth of our economy. From an economic perspective, all of the technology jobs pay well. farther. I’d like to see us invest in training every young person with the basics of technology as a means of earning an income. Brett: The first person who comes to mind is Abraham Lincoln. Aspirational and incredibly humble, he tried and failed, tried and failed over and over again—until he got to the point late in life where he became president. Lincoln had to overcome unbelievable adversity and struggle hard to achieve a place in history. 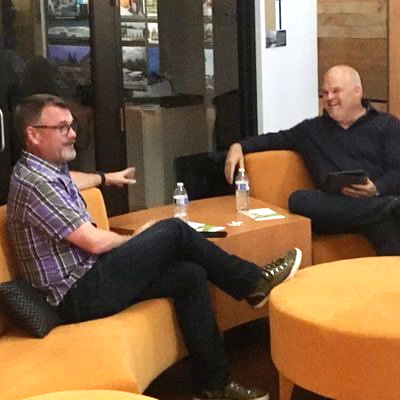 At the 6 Month Startup Kitsap launch event held in Bremerton last June, dozens of people had the chance to hear both Brett Eddy and Dave Parker's insights into the world of ideation, entrepreneurship and the 'give first' philosophy. I’m also personally inspired by Dave Parker, whom I mentioned earlier. His commitment to cross the chasm and invest in founders is amazing. Dave’s a venture capitalist who’s also super passionate about startups. He champions the whole “give first” philosophy, having created initiatives for communities, business people and entrepreneurs to themselves give. As we were creating Startup Kitsap, Dave was open to letting us use his model to create our own version of the 6 Month Startup program at Vibe, where we are the second city to take his program and run with it. That was quite an honor for us. How's the 6 Month Startup program going? Brett: It’s going very well. As a startup ecosystem, Kitsap is in the earliest stages—especially compared to Seattle, Tacoma or even Bellingham. We have quite a few people who are in our community who have tried tirelessly to move this ball forward over the last 10, 20 or 30 years, so we are simply jumping in to continue the work. 6 Month Startup is a practical program to help founders do the work on their idea and company to determine if it is worth pursuing. It’s disciplined and challenging work, but every ounce of effort the founder puts into it goes into their own success. Share with us a bit more about creating a 'culture of can'. Brett: When it’s a company, it’s easy. It starts from the top. You’re the boss. You need to set the expectation that failing is okay, giving everybody the permission to do that. You must be truthful and honest, always. With grace! Criticisms are like pearls. Everyone has to know how to give and receive them. But it has to be done with grace and respect for entrepreneurs to be successful. GIve us an example of how you come up with solutions. Brett: I've been delighted by some of the solutions that come from out-of-the-ordinary places. My good friend and organizational guru Jan Harrison (also a Vibist) once articulated to me that she needed a magic button that does this (marketing report). She said "I don’t know how to make it happen but you do. Can you make it?” That was perfect. Jan and I worked on the problem and created a great solution. How do you feel about being a part of Vibe? Brett: I love it. I’m incredibly excited about the opportunity for intentional community, the serendipity of meetings and having conversations that are unplanned. Vibe is a professional workspace built around creativity and a vibrant ecosystem. Then there are the fun things—like Waffle Wednesdays. What business workplace do you know that does that? Brett's top destinations in the world are all in Hawaii: the North Shore of Kauai; the Na Pali coastline and the cute town of Hanalei. Combine Hawaii's natural beauty with Brett's mad photog skills (this is one of his own shots, of course) and it'll soon be our top destination, too. Brett: I’ve been a photographer for three-quarters of my life, all the way from the days of film, to the transformation of digital. Any time I can spend with my camera on a spontaneous shoot, it feeds my soul. I’m also an outdoors person; love being in nature. Kayaking, hiking, mountain biking, being on the water. You name it. I also love getting together with positive people to solve a problem or brainstorm an opportunity, helping them to become successful in their own businesses. I am fed by that creativity. Oh, and I hate the world “can’t.” I can barely say it. It’s my kryptonite. Who would you say is your greatest female inspiration? Brett: Wow, love that question. In some ways, that would be my grandmother. She was a Navy captain’s wife during the turbulent days of WWII. She grew up in the South and had a way of looking at the world that was always one of wonder. Even in the last years of her life, my grandmother wanted to embrace all that it offered, even the pain. She never wanted to short circuit that blessing. Another person would be our [Vibe Coworks'] very own Alanna. She is an awesome person. I appreciate her impact-minded thought process about just about anything, about how growing business in a capitalistic way can also impact humans for the better. I also respect Alanna’s brain power; she listens well and speaks strongly. But without a doubt, my wife Linna is my greatest female inspiration. She's an amazing woman who inspires me regularly. Linna has an enduring optimism in her outlook on life, is a wellspring of faith and she can be my rudder when I am off trying to conquer the world. "I commuted to Redmond for seven years. Of course, we could have chosen to move to the soulless Eastside, but we love Poulsbo, love Kitsap. So I paid the life tax. Brett: I was flipping burgers at McDonalds, making $3.35 in hour. I learned a great pearl of wisdom then: “If you’ve got time to lean, you’ve got time to clean!” Yeah, that was not my finest career choice…"
What inspired you to make Kitsap home, personally and professionally? Brett: I have roots that go back to my grandparents settling in Kingston back in the 1950s. But it wasn’t until my wife and I moved up from Gig Harbor in the mid-90s to work at Boxlight that we decided to make Kitsap home. When I started working later at Visio, a software company, that was when I started the commute. In those days, it was straightforward. Every morning I would catch the Bainbridge ferry and take the waterfront trolley along Alaskan Way to the World Trade Center near Pier 56 where our office was. I would then change into my work shoes just like Mr. Rogers (laughter). Visio was acquired by Microsoft in 1999 and it wasn’t until 2001 that our office moved from Seattle to the main Microsoft campus. I commuted to Redmond for seven years. Of course, we could have chosen to move to the soulless Eastside, but we love Poulsbo, love Kitsap. So I paid the life tax. And in those days, on New Year’s Eve, my wife and I would have our “year-in-review” date night, discussing our whole life package. We would give it a thumbs up or thumbs down. The first three years, thumbs up. By year five, it was thumbs sideways. And years six and seven? Thumbs down. It was time to move on from Microsoft. I landed at WatchGuard Inc, another public company as an Engineering Manager. During that time, I was doing some public speaking on Leadership and Technology, and was asked to do consulting work for a company innovating the publishing industry called Rosetta Solutions. That engagement turned into my first CTO role. Since then I have held several C-suite positions, including multiple CTO/CIO posts and even EVP for a $50M international print services company, overseeing all facets and staff of Tech, Marketing and Operations. What's your biggest business passion these days? Brett: Today, I help companies with their strategic problems and dreams, including advising large companies and smaller, more nimble ones. And the work that I do to help build the startup ecosystem, like Startup Kitsap, is more about the long-term vision where people are the center—not the tech. We have some significant problems and opportunities in front of this, and it is going to take courage, conviction and determination to succeed. We need each other and we need to get motivated. Kitsap is growing, so that brings great opportunity. This is a great place to live. Quite a few of us are diligently working to make this a great place to work, too (outside of the military and public sectors). That is proving to be the greater challenge.